Making backups of everything you put online is always a sound policy. You never know when a site is going to get hacked, shutter their virtual doors, or just decide to shut down your account for whatever reason. One site that makes data backups a really good idea is Facebook. PhotoGrabber's list of Facebook friends and pages puts you first. Although they are not likely to shut down their site anytime soon, Facebook has been known to shut down user accounts without warning for some perceived infraction of the rules. In instances like this, a free open-source app called Photograbber would be a good thing to have in your back pocket. I prefer similar program fbDownloader because it feels easier to use and is a little more flexible as to what you can download. But PhotoGrabber still has its pros and is definitely worth looking at, especially if you have a soft spot for open source software. 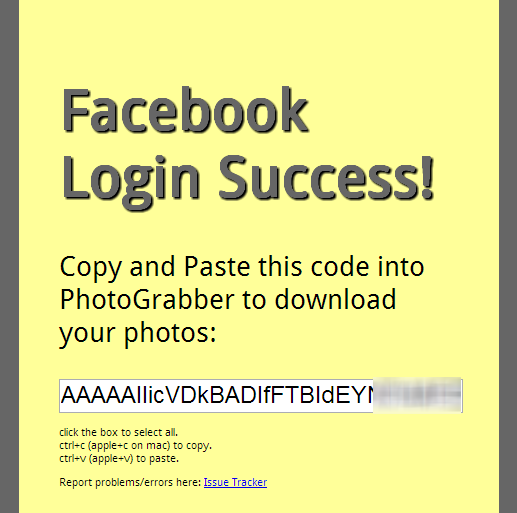 Unlike fbDownloader, PhotoGrabber does not ask you to type in your password, and instead relies on an authentication token issued by Facebook's API. This means that you can revoke PhotoGrabber's access at any time by going to the list of approved apps in your Facebook account and deleting it. This is PhotoGrabber's first big plus, as I am always leery of entering my Facebook password anywhere but the official site. PhotoGrabber then generates another "login token" which you must enter into the app for it to work. Unfortunately, you need a new login token for every download you want to do. If you want to download from several friends for example, then it shuts down each time and you have to restart it and enter a new login token again. It's rather annoying. When you enter the login token, you will see a list of all your Facebook friends, Facebook Pages you have subscribed to, and you will be at the top of that list if you want to download your own stuff. FbDownloader doesn't include Pages, so this is a point in PhotoGrabber's favor. Simply choose the person or page you want to download from, specify what you want to download and off you go. Every time you want to use the app, the developer's site generates an authentication token, which you must put into the app for it to work. This is where I have to make one rather large caveat. Even though some of the photos may be publicly viewable, you may not be able to download them using PhotoGrabber because a user has the ability to block apps, including PhotoGrabber, from viewing their data. So PhotoGrabber can only "grab" what it is allowed to. So if you see 300 photos on the page, but PhotoGrabber only gives you 200, then that's why. The major reason I prefer fbDownloader over this app is because PhotoGrabber is rather restrictive when it comes to you specifying what you want to download. For example, it's either download "all the albums" or nothing. 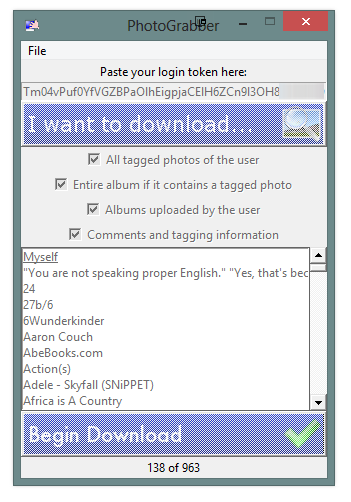 In fbDownloader, you could choose which albums you wanted. Here, you get the whole lot. But the biggest plus for PhotoGrabber is that you can pull in all the comments and tags. If you choose this option, then PhotoGrabber generates an HTML page so you can view this information alongside the photos. This in theory means that you could back these pages up to your own personal domain as another online backup. PhotoGrabber is under active development. If you make backing up something of a religion, then PhotoGrabber is a tool you should use on a continual basis, as well as keeping an eye on the project page over on Google Code. Note: The Download button takes you to the vendor's site, where you can download the latest version of the software appropriate for your system. Back up your Facebook photos with this actively developed freebie.